David is another unlikely hero in the Old Testament. Like Joseph and Moses, he had humble beginnings being the last of eight brothers. It was not likely that he would defeat Goliath the Philistine in battle because he was so small and unprepared. He was only a shepherd boy. He could not even wear the armor because it was so heavy and cumbersome. But defeat him he did, saying, “You come against me with sword and spear and scimitar, but I come against you in the name of the Lord of hosts, “(1 Samuel 17:45). David eventually rises in power and becomes king, but his actions are not always pristine. He falls for Bathsheba, a married woman, and she becomes pregnant from their tryst. Like Moses, he tries to hide it by having her husband killed in battle. That way, she would be free to move in with him. However, later on, he is remorseful and goes back to God for redemption. “People may still choose to sin, but the goodness of God and his everlasting mercy will be seen in the bounty and the regularity of nature’s seasons, “ (Boadt, Reading the Old Testament: An Introduction, 124). We all screw up. We sometimes make the same mistakes over and over again. We may think that there is no redemption for us. But these underdogs of the Old Testament tell us there is. There is always hope. They say, “You think you make mistakes? Look at us! We have made some big ones, yet God’s grace saved us.” It is possible, and that is why these stories speak to us so profoundly. David felt a deeper purpose despite the odds against him. When King Saul died, David prayed to God about it and moved his family to Hebron. He told the people, “Take courage, therefore, and prove yourselves valiant men, for though your lord Saul is dead, the Judahites have anointed me their king, “ (2 Samuel 2:7). Did David really know what he was doing? David was moving into fresh domains where there were no role models (Holladay, Long Ago God Spoke: How Christians May Hear the Old Testament Today, 110). He knew he was meant to be king, yet he had been a lowly shepherd. His resume was wanting, but there was a deeper purpose at stake. As Ruether says, “It is only in that gratuitous and transcendent mystery of freedom, that dawns upon us without our ‘deserving’ it, and before we have articulated our need for it, that we find ourselves able to enter into this articulation and transformation, “(Liberation Theology: Human Hope Confronts Christian History and American Power, 9). David entered into the unknown of being king and became transformed by it, because he knew it was what God wanted of him. He felt his function in life was to serve his people, and became king because he knew he could secure the nation for them. Their lack of self ego makes these underdogs of the Old Testament the unlikely heroes that they were. This helps us relate to them and want to be like them. “…the hero is a person who lives in close contact with the inner world of the unconscious and its spiritual powers. This brings the hero stories closer to us…all of us have the potentiality to become the hero, each in his or her own way, “ (Sanford, The Man Who Wrestled with God, 86). Do you sometimes hear that little voice that tells you you can’t do something? Do you think it is from God? Do you think it keeps you from a full relationship with God? Have there been times when you have felt unprepared yet felt you were called to do something? How did it turn out? Do you feel the Holy Spirit was a part of it? How might you be a hero for God in your own way? 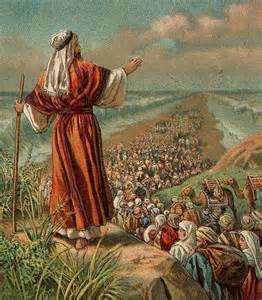 At the time of Moses’ birth, Pharaoh commanded all Hebrew boys to be thrown into the river. The Hebrews’ were the Egyptians’ slaves and he did not want them to become too numerous or powerful. Moses was born to Levite parents; rather than seeing him die, they put him in a basket and “threw him in the river”, hoping he would be found and by an Egyptian woman with good intentions. Fortunately, our hero Moses was found by Pharaoh’s daughter and his own mother chosen to nurse him. So there is duality here. Many baby boys were slaughtered, but Moses was rescued. Moses came from humble, Hebrew roots, but he was raised by the Egyptians. It is typical in many folktales for future heroes to be born in the midst of danger and uncertainty (The Man Who Wrestled with God, Sanford, 85). Moses could have died, but he did not. He could not have been found and left abandoned, but that did not happen. It gives hope for those hearing the story. People hearing this story that might be in dangerous situations or feeling lost and abandoned may be comforted. “The time of crisis and judgment, then, also becomes a moment for the birth of far more transcendent hopes and the glimpsing of more exalted possibilities in radical contrast to the blackness of the present, “ (Liberation Theology: Human Hope Confronts Christian History and American Power, Ruether, 25). Moses got out of his desperate situation, and so can we. Underdogs are not perfect. This is another underdog trait – not always getting it right. Moses had a discerning heart, but he was not always good about going to God with his decisions. When he witnessed an Egyptian hitting one of his own kind, he killed him, hid him in the sand and fled to the land of Midian. Moses goes through a dark journey before realizing who he is meant to be. He not only kills someone, he hides the evidence and runs away. Moses had to go through this time. He needed to feel that tension and develop psychologically before he was ready to fulfill his divine calling (Sanford, 83). But God is able to see through his failings into what Moses will become. After Moses killed the Egyptian and flew to Midian, he started a very comfortable life. He became a shepherd, got married and settled down. Sanford says, “If he lived today we would no doubt find him somewhere in suburbia, going to the office during the week, mowing the lawn on Saturdays, and taking the family on outings in the family camper on Sundays, “ (92). Life was good. But something must have been stirring in Moses. This deeper purpose he felt was not going away. When he came across the burning bush, his curiosity got the best of him. “Curiosity, the desire to know, is a powerful instinct, often used by God to draw us into life and our individuation. But it is a troublesome instinct, “ (93). This unlikely hero is driven by what he feels must be God’s will for him, even when he does not completely know what it is. Moses could have stayed in suburbia, but he chose to enter into the holy chaos because he knew that was where he was meant to be. Underdogs are not always sure they are the right people for the job. Moses did not think he could be the voice for his people. He says, “Who am I that I should go to Pharaoh and lead the Israelites out of Egypt?” (Exodus 3:11). God does not argue with him; he doesn’t even try to boost his spirits. God only responds, “I will be with you,” (Exodus 3:12). Moses cannot do it alone; he needs God’s help. Once Moses realizes he isn’t going to be able to get out of this calling, he still battles with God. He tries to get out of having to speak publicly, saying, “…I am slow of speech and tongue, “ (Exodus 4:10). God does not let him give up so easily. God says he will help him, and then relents and lets Aaron be his spokesman. However, it is not long before Moses is speaking to the Israelites directly. God does not let us give up on ourselves, especially when there is a mission at stake. “The work of liberation is God’s work first and last, “ (Chaos and Grace: Discovering the Liberating Work of the Holy Spirit, Galli, 95). In other words, there are bigger issues on the line than the underdog’s lack of confidence. Moses never claims the credit for being heroic; he continually sees himself only as an instrument of God (Reading the Old Testament: An Introduction, Boadt, 164). Moses would continually consult with God on Mount Sinai or in the tent to help make decisions for the Israelite people, to the point that his face was radiant. God even says to Moses, “This request, too, which you have just made, I will carry out, because you have found favor with me and you are my intimate friend, “ (Exodus 33:17). There is a selfless quality in that trust that cannot be denied. Yet it is this selflessness that actually uplifts the underdog. “And who are we? We are the contingent ones, dependent utterly on this God…who must cling consciously to his God, who gives and takes beyond all understanding, “ (The Gifts of the Jews, Cahill, 86-86). It is God’s grace. How are you contingent upon God, like Moses? This is a very good article on praying that may inspire you to read his book with the same title. The other book this author has written, Where the Hell is God?, is in our parish library. Do you remember this song by Sting: If You Love Somebody Set Them Free? I think the premise of the song is we need to love freely and without condition. The minute we put conditions or controls on that love, we’re in trouble. I’ve been thinking about this a lot lately. According to the Linns’ book, Sleeping with Bread: Holding What Gives You Life, God’s will is always for me to give and receive more love. We should love freely. There should be no conditions on it. I get that, but in reality, this is not always easy. Oh, we hear in church how we should just love everybody, and we nod in agreement. Yes, of course. Love. Got it. But what happens when love is hard? Or it isn’t returned? Or it is returned but not in the way we wish it was? What if we put ourselves out there with our love, and it flops? What then? Does this make any sense? Maybe an example will help. I have a friend who recently moved away. She is having trouble keeping in touch with the friends she still has here. Suddenly, her friends are too busy to call or put the effort in that it takes to keep a long distance relationship going. She is debating what to do. Let go of the friendship (set it free) and see what happens? Or hang in there and continue to work at it? I don’t know if there is an easy answer. Fear gets in our way. Love can be a scary business. There is trepidation when we put ourselves out there and don’t know what will happen. We could get hurt. So it’s easy to let fear creep in and make our decisions. But it doesn’t leave space for God’s help. We are called to let God in and love. A free life is one where we give and receive more love. It’s loving as we are free to love. Gratitude when it is returned. Not fearing the outcome of that love. Risking the vulnerability and loving anyway. This is no easy task, but there is comfort knowing God is there in the midst of it. How do we do this, to love so freely? It seems like prayer goes a long way with matters of the heart. If God wills for us to be these love machines, inputting and outputting love freely, then God will help us do it. Trust that. Whatever we decide in our relationships, the loving choice seems to be the right choice. Even if it’s the hard one. Sometimes the loving choice is letting go and seeing what happens. Sometimes it means hanging in there with love, even if it’s not the way we imagined it to be. Maybe the loving choice is waiting. Waiting for an answer. Waiting for a peace to be felt. Waiting for God’s answer to come. I believe it always comes when love is involved. What do you think? Talk it over with God. See if Sting sings true for you! I wonder how the seventy-two disciples reacted when Jesus told them that he was sending them out as “Lambs among wolves.” They were probably not that excited. They may have even pointed out to the Lord that the last time the wolves played the lambs the game was not even close. You might even say it was a slaughter. Ba-dum-bum. A trait of the underdog: humble beginnings. Joseph was the second-to-last son born to Rachel and Jacob. Rachel had been barren and God heard her prayer for fertility. She named him Joseph, meaning, “May the Lord add another son to this one for me! “(Genesis 30:24). As Joseph grew, he became a shepherd and was favored by Jacob. This made his other brothers angry and jealous, to the point of wanting to kill him. They end up selling him as a slave, and he is taken to Egypt. Once in Egypt, Joseph gets into more trouble when his master’s wife wants to sleep with him and he refuses. In a rage, she blames the ordeal on him and he ends up in prison. So the scene is dismal for Joseph in the beginning. “But even while he was in prison, the Lord remained with Joseph, “ (Genesis 40:20). The chief jailer learns how Joseph can interpret dreams. 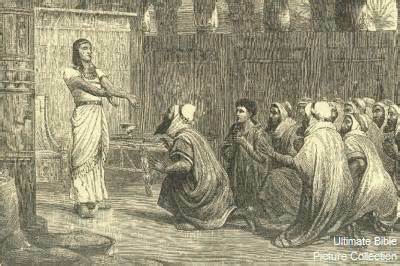 This becomes Joseph’s “in” with the Pharaoh once the Pharaoh has need for an interpreter. Yet even when Joseph can interpret the Pharaoh’s dream, he says, “It is not I but God who will give Pharaoh the right answer, “(Genesis 41:16). Joseph continues to trust in the Lord despite his lowly circumstances at the time. Because of this, he slowly rises in power. Eventually, the Pharaoh makes him the grand vizier, an authorized representative of the king, and the director of the palace. He marries the daughter of the highest priest in the land and has two sons from this marriage. 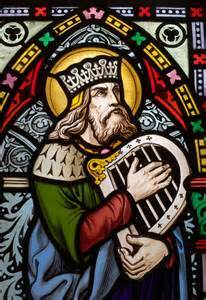 He is the most powerful man in the kingdom (Von Rad, Genesis, 377). When famine comes and Joseph’s brothers need food, it is Joseph they must go to see, though they do not know it is him. After several tests and delays, Joseph eventually reveals himself to them. Rather than seek revenge, Joseph forgives his brothers in great emotion and reaches out to them. He goes as far to say that they should not feel guilty because, “It was really for the sake of saving lives that God sent me here ahead of you, “(Genesis 45:5). Von Rad reads this moment as, “God’s hand directs all the confusion of human guilt ultimately toward a gracious goal, “(398). Joseph rescues his brothers and asks them to move nearby so they would be closer to him. The little brother they hated becomes their hero. Another underdog trait: perseverance. Joseph showed perseverance in building back the relationship between himself and his brothers. Joseph does forgive his brothers for abandoning him, but he was not passively tolerant. He dealt with them severely and boldly by keeping Simeon in prison and sending the rest of the brothers back home for their little brother Benjamin (Von Rad, 437). He persisted because he wanted to be sure they were being true and honest, yet there was love there. Before the brothers departed, Joseph put the money they brought back in their sacks without them knowing it. This was a sign of his deeply veiled love for them (Von Rad, 384). Love, truth and honesty make the underdog persevere, even when the desired outcome is uncertain. How does Joseph speak to you today? Http://www.thefreedictionary.com describes an underdog as, “the competitor least likely to win a fight or contest, and a person in adversity or in a position of inferiority.” Underdogs are unlikely heroes. They may have had humble beginnings or grew up in less-than-ideal circumstances. Their place in society may have been lowly. They could be considered unpopular. Underdogs may be reluctant, meaning they lack self-confidence, laugh at their ability or do not trust themselves. Underdogs are not perfect; as a matter of fact, they may make big mistakes that are irreversible. Yet despite all of these inadequacies and flaws, they know they have a deeper purpose. They are driven to move forward and fulfill their calling. Why do underdogs make good heroes? We see ourselves in them. They are relatable. We can all be heroes despite our failings and unworthiness. Being an underdog calls for perseverance and a determination to fight for something greater than our own being. Underdogs give us hope. They remind us that there is a way out of our meagerness and toil. They call us to look outside of ourselves to a greater wholeness. Circumstances do not have to be ideal to have everything turn out well in the end, and we can all identify with that. One trait of an underdog…reluctance. Underdogs are not always sure they are the right people for the job. Abraham and Sarah displayed reluctance. When God said they would bear a child despite their old age, Sarah laughed. She laughed that she and Abraham would have the ability to create a child; yet God laughed last. Isaac was born to them. For the underdog, it may seem impossible; but for God, everything is possible. God made a covenant with Abraham. “I will maintain my covenant with you and your descendants after you throughout the ages as an everlasting pact, to be your God and the God of your descendants after you, “ (Genesis 17:7). Yet Abraham still had moments of reluctance. When he entered the land of Negeb, he was afraid that the people would kill him because Sarah was so beautiful and they could not have her. He made Sarah say she was his sister, but of course his lie was found out. Abraham says, “I was afraid because I thought there would surely be no fear of God in this place, “(Genesis 20:11). He was always granted safe passage despite his fear. God provided for him. God sees past our fears to the other side of them. Another trait of the underdog…serving others. Abraham, even while being a great leader for his people, reached out and served three strangers that happened to be going by his tent. He put himself in the underdog role. 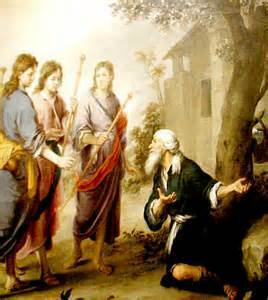 He bowed to the strangers, and asked them, “…please do not go past your servant, “ (Genesis 18:3). Not only did he bring them water and offer a cool place to sit, he had rolls made of fine flour and had special meat prepared. It was Abraham himself who waited on them. It is unclear if Abraham ever discovers that it is God’s self who is one of the strangers (or perhaps all three as Trinity?). Abraham naturally serves others in his leadership role. What can Abraham teach you?